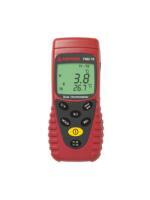 Product Description: The Amprobe TMD-10 is a completely portable dual input thermometer. With a digital dual display that displays T1, T2 and T1-T2. Choose between Celsius or Fahrenheit degrees measurement results. The TMD-10 will store and later display your minimum and maximum values. Will measure temperature with either Type K or Type J thermocouples. Ships as a complete kit with carrying case, two Type K probes, battery and manual.